Entrants should be aged 14 - 18 years old on the closing date for entries - 1st March 2019. Enter online, by email or post for the�Hippocrates Young Poets Prize for Poetry and Medicine. The Hippocrates Young Poets Prize�is supported by healthy heart vharity the�Cardiovascular Research Trust,�which promotes education for the prevention and treatment of disorders of the heart and circulation. Heart charity patron Leslie Morgan OBE DL said: “The CVRT is delighted to have such international interest in the Hippocrates Young Poets Prize. The CVRT is also grateful that the 2019 Hippocrates Awards Ceremony will be held at the Centre for Life in Newcastle-upon-Tyne in the UK at the 10th annual international Hippocrates conference on poetry and medicine, which is being jointly organised by the Hippocrates Initiative for Poetry and Medicine and the�Newcastle Centre for the Literary Arts. Shortlisted poets will be informed by email and information about the shortlist and the commended entries posted on the Hippocrates Prize website. The winners in the 2018 Hippocrates Young Poets Prize will be announced�at the�Hippocrates Awards ceremony�on Friday 11th May 2018 at the Poetry Foundation in Chicago. Elizabeth Smithers�is a poet who lives in New Zealand.�Elizabeth Smither has published 18 collections of poetry. 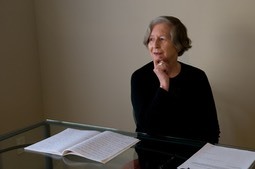 She was Te Mata Poet Laureate (2001-3), and was awarded an Hon DLitt by Auckland University and the Prime Minister’s Award for Literary Achievement in 2008. She also writes novels, journals and short stories, and is widely published in Australia, Britain and USA. She was awarded the Sarah Broom Poetry Prize in 2016 and her most recent poetry collection,�Night Horse,�won the Ockham NZ Book Award for poetry in 2018. Professor Donald Singer is a clinical pharmacologist and President of the Fellowship of Postgraduate Medicine. His interests include research on discovery of new therapies, and public understanding of drugs, health and disease. Professor Michael Hulse is a poet and translator of German literature, and teaches creative writing and comparative literature at the University of Warwick. He is also editor of The Warwick Review. His latest book of poems,�Half-Life�(2013), was named a Book of the Year by John Kinsella.